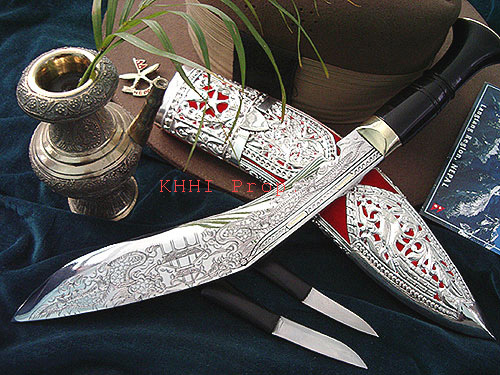 Khukuri with exclusive silver scabbard and dragon carved displayed in the blade; a precious historic collection and excellent gift..
Kothimora Dragon is one of the most renowned piece of art mostly bought as decorative and or gifts, this work of art is further enhanced by the dragon engraving done on both sides of the blade. The blade is beautifully carved with dragons however the dragon carving does not have any significant meaning. It is just another picture that suits well on the shape of the blade. The elongated shape of the Dragon follows through the panel of the kukri blade and finishes giving a suiting and soothing look to the blade. All carvings are done by hand using only basic tools. It takes about 5-7 hours to get a dragon done in a one standard blade. Kothimora khukuri has a 10 inch long blade with dragon carved blade and thus the name 'Kothimora Dragon'. The kukri case is exclusively designed using pure silver filigree with top quality velvet background. Different beautiful patterns are carved in the scabbard depicting cultural and traditional values using only domestic tools. As mentioned above, it is a very special and old type of kukri widely used for ceremonies and given as gifts to mark one’s respect and appreciation. The blade is highly polished and handle made from horn and polished to complement with its very attractive silver scabbard. 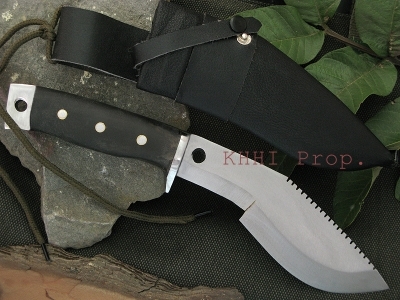 Kothimora in strict khukuri term means khukuri knife with a silver scabbard. 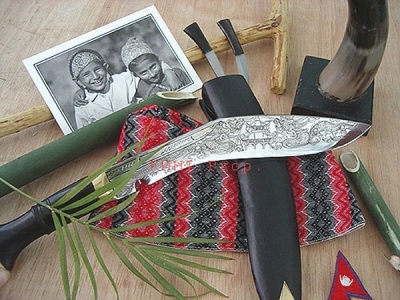 It is a khukuri that has a special place and value in Nepalese culture and society. The exclusive silver scabbard with beautiful carvings in it also makes this khukuri a first choice gift to express one’s appreciation and gratefulness amongst Nepalese especially the Gurkhas (Nepalese in Army). The history of the knife dates back to mid eighteen hundreds when Kings and Generals of Gorkha possessed kothimora to reflect their rank, status and authority (many historic paintings also show this). People from very high ranks owned kothimora decorated with gold, precious stones, ivory and diamonds sometimes to demonstrate who is in command. Kothimora then were actually known as “Kothi-Moda”, which in Nepalese literature means molding in and around the chape portion of the scabbard; Kothi - Chape, Moda - to Mould. Since silver turned out to be the best materials amongst the selected and gave a precious and distinct look to the khukuri, it was extensively used; the trend that exists still today. However Kothimodas then were much different than present ones. Kothimora is also worn as a part of bridegroom’s ceremonial dress in Nepalese marriage custom. The bridegroom tucks his kothimora khukuri in his sash and keeps it throughout the ceremony. This is done in a belief that the khukuri would safe guard him and protect his new family from evils, sins and bad spirit. The khukuri would also fill in for him in his absence in ritual practices. The legendary customary in British Gurkhas of giving away souvenir pieces to retiring officers for their loyalty and service is only completed by a Kothimora. Typically “Regimental Kothimoras” (Kothimora with regimental cap badge mounted on it) are presented to retiring officers to mark his long service, dedication, discipline and also army’s satisfaction by his comrades. Thank you Roshan! The package arrived and it looks wonderful! I greatly appreciate the product and your communications with me. I will certainly purchase from you in the future!